This is no small accomplishment, winning 158 games in his fifteenth season, with one regular season game left. There is an excellent post on the life history and career of Bob Stoops, from the kid in Youngstown, Ohio until now, with all of his accomplishments, awards and testimonials from some of the best known coaches in college history. It is called Broad Shoulders. On this evenings Sooner Football show with the coach, he was embarrassed and humbled to discuss it and hear his praises being sung, but he was also quick to point out not only the wonderful coaches and players involved with that record, but also the fact that he has had the same University President and Athletic Director during his fifteen seasons. That tenure combination of administrators and coach itself is a current NCAA record. With so much competition in NCAA football, the desire to win at any cost is evident with many schools, often to the detriment of the players, like FSU. For coach Stoops to have been so successful, while winning the right way, is a source of pride for many Sooner fans even if we can’t hardly wait for another National Title. One thing I know coach Stoops takes great pride in is the academic accomplishments of his players and never hesitates to praise his players on his television show. Earlier in the week it was announced that nineteen OU players had earned Academic All-Big 12 honors. May you have continued success and a blessed life. Saturday 16 Oct 13 was a memorable day at Owen Field and not all of it was about football. *The starting QB was injured and replaced with the QB he had replaced due to injury early in the season. *Coach Stoops tied the legend Barry Switzer for most wins in his OU career. *OU racked up the most rushing yards in a game in the Stoops’ era. The soldier, First Sergeant Brian Curtis of the Oklahoma National Guard(a 23 year veteran), that was honored at the end of the first quarter was without a doubt the highlight of the day. His family didn’t know he would be there and he arrived on the field with the fantastic honor of riding the Sooner Schooner. The full video could not be embedded, so click this link for the video. 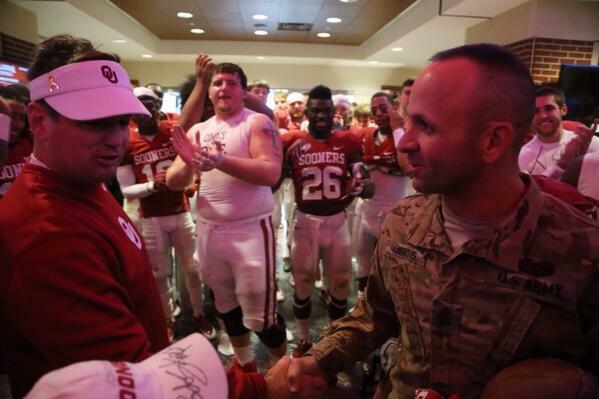 After the game the First Sergeant and his family were invited to the Sooner’s locker room, where the soldier was given the first game ball after the victory. The camera man that was injured? What a character, even with broken ribs he showed an incredible spirit by making the OU sign and waving to the crowd. As for the game itself, it was really dull until about 90 seconds before half time, with ISU leading 10-3. From that point on OU scored 45 unanswered points giving the hapless Cyclones their ninth loss of the season. The victory did, however, tie Coach Stoops with Barry Switzer at 157 wins. One more victory will make him the all-time leader in OU coaching history, a coaching history unlike any other in NCAA football. OU football is the only program with four coaches that have over 100 victories. Coach Stoops has accomplished this record in his fifteenth season, while Switzer did so in sixteen, but they play more games each season now than they did during Switzer’s years, thus a much higher winning percentage than Stoops. As for the QB situation, OU is right where it was at the start of the season, unsettled at QB. The offense has shown, at times, what it is capable of, but has been entirely too inconsistent, thus the two losses to teams they could have beaten. How the season will end is anyone’s guess, with two tough games left on the schedule, both on the road at K-St. and OS-Ewe, then the obligatory bowl game. While the season has been a disappointment, there have been many memorable days and plays, as evidenced by events this past Saturday. Was anything in this bill of goods known as ObamaCare done in highest good faith with the American People? Going back and looking at the record is helpful. And sickening. And infuriating. Tar, feathers, and pitchforks are called for. Period. Wins against the Crimson Tide are rare for my Bulldogs. Heck, they’re rare for any ball club. Two teams that ran the triple-option offense and played stout defense played their hearts out that day. It featured the inventor of the Wishbone, Emory Bellard, and the legendary Bear Byant. The keys to the Bulldog win were winning the turnover battle, and playing a more physical game than Alabama. If my Bullies have a chance in the upcoming game, these will again be the keys to victory. The video from November 2, 1980 is a classic. It even has famous Coke commercial featuring Mean Joe Green. Healthcare.gov: the latest excuse, oh my! 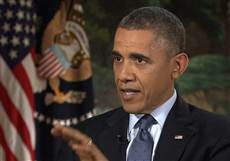 Isn’t it interesting how this latest excuse for the mal-performance of healthcare.gov fits so nicely with President Obama’s “burned by a website” expression of regret last night on NBC? side note: Isn’t it funny how commercial firms seem to be able to handle problems that have flummoxed the $600 million healthcare.gov website? There is much I don’t know and don’t understand about teams wearing hideous uniforms. Baylor’s choice for what should be a great football game is just baffling. Their school colors are green and gold. They aren’t alone in this fad, Oregon has been disgusting and hideous since they began, with their school colors(psychedelic green and psychedelic yellow) obviously the creation of some stoner in the OU horticulture department. Then recently I saw Arizona State(school colors maroon and gold) wearing all red uniforms with black letters. One thing I do know is this is a big game for BU and OU, both ranked in the Top Ten. Considering that OU leads the all-time series with BU 21-1, that BU has never won the Big 12 conference championship and that BU is ranked in the top Ten for the first time in my life time and is averaging 64 points a game against seven opponents with a combined record of 27-30, it is understandable that BU is willing to try anything that will give them an edge. I just don’t understand what is up with the all black uniform. It isn’t like they are going to play with the lights out or with lots of shadows to hide in. If BU is Shinobi, then OU is Samurai Jack, dressed in all white with Crimson trim. The heart of the OU Sooner’s was ripped out, thrown on the ground and stomped on with heavy boots, this past Saturday(26 Oct 13). A starter since his Freshman year, Trey Millard was not only the most popular player with fans, he was invaluable. Trey did everything, he was a superior blocker, efficient runner, outstanding receiver and a superlative special teams player. Now, Trey has knee surgery and rehab to contend with and the Sooners have to find several players to fill all the roles this one magnificent player filled. I wish nothing but the best for Trey in his future endeavors and I am grateful for nearly four years of wonderful memories of him being a great Sooner. Click this link for a great video compilation of Trey Millard’s career.